Details relating to the French Commemorative of 2017. 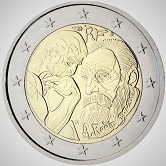 This coin commemorates the 100th anniversary of the death of the famous French sculptor Auguste Rodin. Rodin was born in 1940 and is regarded as a leading representative of the realistic style. Some of his better known works include The Thinker, The Kiss and Hell’s Door. The Thinker, in particular, is known and admired by anyone who has even a nodding acquaintance with sculpture. The design of the coin has two motifs – on the left The Thinker and on the right facing his famous creation,Rodin. At the top is the country designation RF, preceded and followed by the mint mark the mark of the mint master. Around the edge of the inner circle, from six to three o’clock is the inscription: “A. Rodin 1917-2017”. Return from French Commemorative 2017 to euro coin collector.